Cara Coombe is on the verge of graduating from a Bachelor of Photography at Griffith University and is currently involved in a three week infield project in New York, that will result in a group exhibition at NARS Gallery. 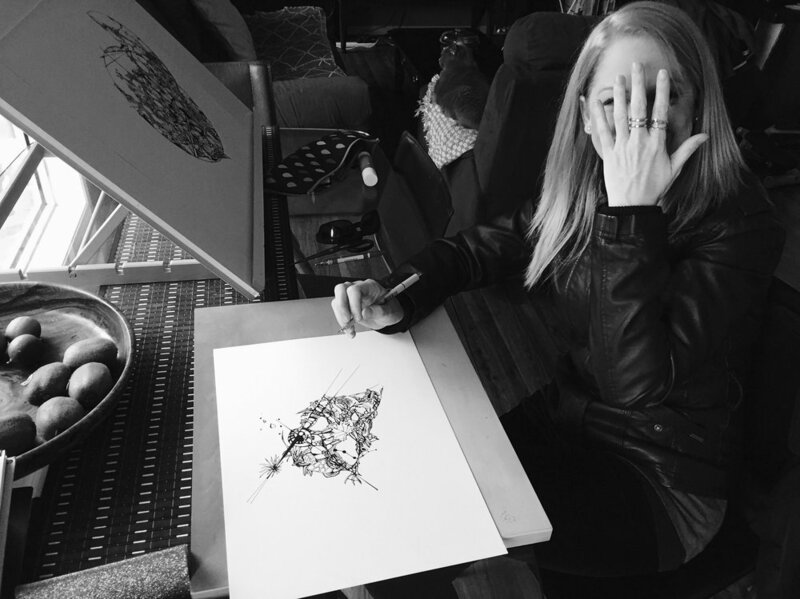 She describes her work as abstract through using the photographic medium… and is working hard to build up her arts career by making her passion her purpose. How would you describe your arts practice and style? ~ I think a lot of my recent work is abstract, obviously it is photographic in medium. Definitely conceptual and my practice at times is uncouth! What opportunities have you been involved in as a photography student? ~ In October I will be travelling with other students and tutors to New York for three weeks commencing in an exhibition at NARS Gallery. But too, I think I often take for granted the opportunity of working alongside and being mentored by professional artists every day. What subject matter excites and inspires you to keep making work? ~ The subject matter I usually explore is the human condition. When I was younger I was diagnosed with an eating disorder and OCD and from there I kind of used my art to explore these issues further and to express myself. I think subconsciously I use my art to wrap my head around the things going on in my life and it often stops things from becoming so overwhelming. What are your big plans for the next 12 months? ~ I’m usually someone who likes to plan everything out but the next 12 months for me are a little everywhere. I’m hoping to graduate soon, which is very exciting but from there I’m thinking of taking a year off of study before potentially completing my honours. I’m hoping to travel back to my hometown in England for a few months for the first time since I was eight! So maybe that will inspire my next big body of work. But in the meantime I’d like to have my first solo or group show outside of university and exhibit my current body of work. What has been your biggest challenge as a student? ~ I’ve had a pretty rough past three years in my personal life unfortunately and this, on top of the stress of university, has at times been very challenging. You have moments when you question what you are doing and who for but I think if anything it has really motivated me, I want to be an artist, I always have, so I know now that when the incline to my goals get a little steeper, I need to centre myself, find another gear and keep going. What does success mean to you? ~ It sounds super cheesy and cliché but honestly, success to me is happiness, and I derive my happiness from being true to myself. As long as I continue to make and show my work, even if only locally, then I will be truly happy and successful. What are your other interests and do they intersect into your work? ~ I’m a real movie buff so whilst I don’t work in video, I often get a lot of visual inspiration from movies. I’ve also always been really interested in psychology, sociology and history which probably explains my interest in the human condition that translates into my art. As an emerging artist, who have been your advocates and how important is it to you to have people in your corner? ~ I think I’ve always been very lucky in this respect, my parents have always respected and supported my dream of becoming an artist. I also think the community we have here at university is amazing, from peers to tutors, we are always backing one another and this is incredibly important to achieve any kind of success. Instead of constantly feeling in competition with other artists, support each other, encourage each other and you never know what opportunities could come of it. Are you working towards any projects or exhibitions and what are they? ~ I’m currently completing my major body of work for the year which will feature in the graduate show in November, and I’m also in the early stages of planning the project I will conduct in New York.